With 70 percent new readings, the Sixth Edition of International Political Economy has been extensively updated to reflect changes in the scholarship and the global economy. This compact book brings together a flexible and provocative set of articles and excerpts on a broad range of topics, including the global economic crisis, international migration, and the ongoing challenges in the Eurozone. The text also provides clear introductions and headnotes to help students get the most out of each reading. 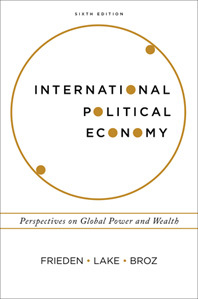 International Political Economy provides a flexible set of readings on a broad range of topics in IPE. In this major revision, Frieden, Lake, and Broz take full account of recent developments in IPE scholarship and in global economic events. The Sixth Edition includes new selections on current topics like the Eurozone crisis and the economic impact of migration, as well as seminal pieces that have shaped the field as it is understood today. Each of the reader's eight parts begins with an introduction in which Frieden, Lake, and Broz provide helpful context and explain how the diverse perspectives presented in each part relate to one another. A headnote at the start of each reading highlights the selection's significance and focuses students on the main points they will come across as they read. With 32 substantial readings expertly edited by 3 highly respected scholars, International Political Economy offers an affordable alternative to monographs, unedited articles, and more narrowly focused readers—in a format that is convenient for both instructors and students. 25	Do Interest Groups affect US Immigration Policy?